FluGen has raised $3.4 million in convertible debt financing to help the Madison, WI-based biotech startup push its universal flu vaccine into human trials next year, Xconomy has learned. The $3.4 million is a bridge financing round, and the company is now seeking an additional $3 million or more in a Series B venture capital round that would—along with a new $4.7 million NIH grant—help fund Phase Ia and Ib clinical trials for FluGen’s Redee Flu, president and CEO Paul Radspinner said today. The goal would be to close the Series B round by August and enter clinical trials early next year. FluGen, founded in 2007, previously raised about $12 million from local and out-of-state investors, including Madison-based Venture Management and Knox LLC, a private East Coast fund, Radspinner said. A few years ago, the company was developing a vaccine delivery device, but has since scrapped those plans to focus on Redee Flu, which is intended to protect against multiple types of influenza, including seasonal flu and outbreaks of pandemics such as avian flu. The company also has a pre-clinical vaccine candidate to fight respiratory syncytial virus, or RSV, Radspinner said. 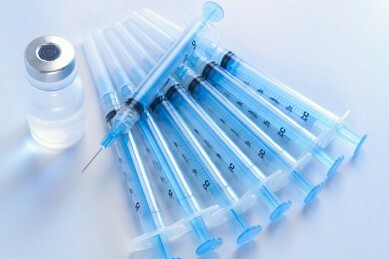 Data from the company’s early animal tests for its universal flu vaccine are promising, Radspinner said. FluGen aims to introduce a vaccine that trumps the “poor efficacy” of most current flu vaccines, which hover around 50 percent, he said. But he recognizes that achieving successful results in human trials is an unpredictable and challenging task. Funding will also be difficult. “Because at what point are the six to seven (biopharmaceutical) companies that we would potentially partner with, when are they willing to come in and make the bet on a universal flu vaccine?” Radspinner said. Radspinner, a FluGen co-founder, has more than 15 years experience in biopharmaceutical management, including overseeing the Wisconsin Alumni Research Foundation’s pharmaceuticals portfolio. FluGen’s other co-founders are Yoshihiro Kawaoka, a well-known influenza researcher with joint appointments at University of Wisconsin-Madison and University of Tokyo, and Gabriele Neumann, who has researched influenza for more than 15 years and worked as a senior scientist at Wyeth.